A Big Data Center collaboration between computational scientists at Lawrence Berkeley National Laboratory's (Berkeley Lab) National Energy Research Scientific Computing Center (NERSC) and engineers at Intel and Cray has yielded another first in the quest to apply deep learning to data-intensive science: CosmoFlow, the first large-scale science application to use the TensorFlow framework on a CPU-based high performance computing platform with synchronous training. 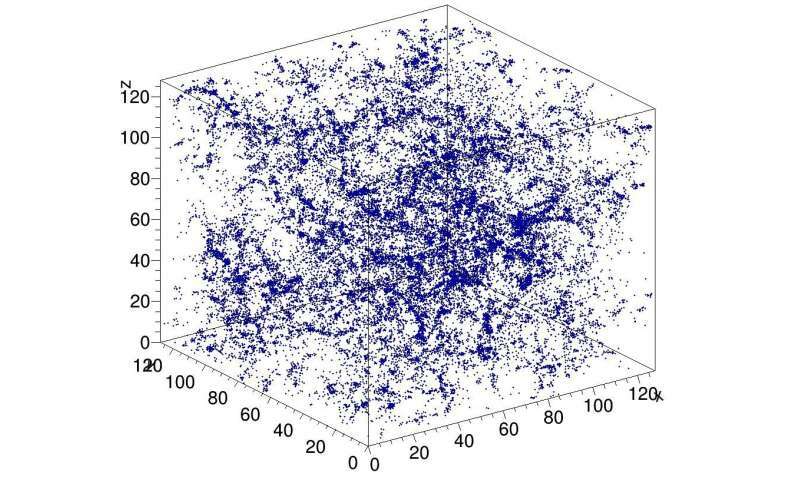 It is also the first to process three-dimensional (3-D) spatial data volumes at this scale, giving scientists an entirely new platform for gaining a deeper understanding of the universe. Motivated to address these challenges, CosmoFlow was designed to be highly scalable; to process large, 3-D cosmology datasets; and to improve deep learning training performance on modern HPC supercomputers such as the Intel processor-based Cray XC40 Cori supercomputer at NERSC. CosmoFlow is built on top of the popular TensorFlow machine learning framework and uses Python as the front end. The application leverages the Cray PE Machine Learning Plugin to achieve unprecedented scaling of the TensorFlow Deep Learning framework to more than 8,000 nodes. It also benefits from Cray's DataWarp I/O accelerator technology, which provides the I/O throughput required to reach this level of scalability. Early on, the CosmoFlow team laid out three primary goals for this project: science, single-node optimization and scaling. The science goal was to demonstrate that deep learning can be used on 3-D volumes to learn the physics of the universe. The team also wanted to ensure that TensorFlow ran efficiently and effectively on a single Intel Xeon Phi processor node with 3-D volumes, which are common in science but not so much in industry, where most deep learning applications deal with 2-D image data sets. And finally, ensure high efficiency and performance when scaled across 1000's of nodes on the Cori supercomputer system. As Joe Curley, Sr. Director of the Code Modernization Organization in Intel's Data Center Group, noted, "The Big Data Center collaboration has produced amazing results in computer science through the combination of Intel technology and dedicated software optimization efforts. During the CosmoFlow project, we identified framework, kernel and communication optimization that led to more than 750x performance increase for a single node. Equally as impressive, the team solved problems that limited scaling of deep learning techniques to 128 to 256 nodes—to now allow the CosmoFlow application to scale efficiently to the 8,192 nodes of the Cori supercomputer at NERSC."